When I was growing up, International Women’s Day, March 8th, was a good holiday: unlike most other holidays, it was a non-political one (well, almost); it was a non-discriminatory celebration (it didn’t matter if you were young or old, single or in relationships, with or without kids); and it was a public holiday, so nobody had to work or go to school. Back then this holiday was like a combination of Mother’s Day and Valentine’s Day but for women only. In days before the holiday, people would have a potluck lunch/happy hour at work; boys would bring sweets and flowers to girls in their class; there were special programs on TV and radio. On the day itself families or friends would have a celebratory dinner or a party. Husbands, sons, fathers, partners, male friends and co-workers would be presenting women in their lives with flowers and, sometimes, gifts. And did I mention it was a day off? I was fourteen or fifteen. At that time I didn’t have a boyfriend, so on March 8 I spent half the day out with friends. When I came home, I found there a bouquet of narcissuses waiting for me. My mom told me that some boy dropped them off for me. She didn’t recognize him (it meant he wasn’t from my class since she knew all of them), he didn’t tell his name, and there was no card. Since flowers were expensive at that time of the year and not that easy to get, I was sure it wasn’t a practical joke of any kind. So I was intrigued and thrilled: I had an actual secret admirer out there! You normally read about it in books or see it in movies, it doesn’t happen in real life! For the next month or so I was trying to figure out who that might be, waiting for him to make the next move, hoping it would be somebody I liked. This story doesn’t have an ending – happy or otherwise: nobody ever admitted bringing me that bouquet. But several decades later I still remember those flowers better than I remember many dozens of bouquets I got over years from people I knew and loved. After I moved to the U.S., I stopped celebrating International Women’s Day. But since I enjoyed so much our recent Month of the Roses project, I decided to run on my own a mini-project for the first week of March – Week of Narcissuses. I didn’t realize I liked narcissus in perfumes until I started noticing it again and again in the notes lists of my favorite perfumes. Climat, Miss Dior, Chanel No. 19 – these all have narcissus. But this week I focused on perfumes, in which I thought that note was more prominent. Hermès Eau de Narcisse Bleu attracted my attention (see Birgit’s review) because it had galbanum and narcissus, and it came in a blue bottle. It is a true spring perfume with wonderful combination of greenness, blossoms and wood. My 15 ml bottle looks cute and will probably serve me for a while. If Penhaligon’s The Revenge Of Lady Blanche perfume’s opening stage would hang around for at least 2-3 hours, I would have probably be contemplating the purchase of that 75 ml bottle – I love the opening that much (panther head top doesn’t hurt either). But [un]luckily, the opening gorgeousness disappears within the first 30 minutes, if not faster, which would probably justify the size of the bottle but not its price. But you should definitely try this perfume to experience a beautiful combination of iris and narcissus. Galbanum is not one of the notes either listed or mentioned by anybody else, so if I were you I wouldn’t trust my nose, but I smell galbanum there as well. I sought and tried Parfums DelRae Wit because it had Daphne – my dream note in perfume. While it smelled nothing like Daphne odora blossom, in general it was pleasant enough for me to go for a decant. It’s a beautiful spring bouquet with narcissus prominent enough to fit into this quest for the perfect narcissus. I wish DelRae would finally release their perfumes in 15 ml bottles: I would buy Wit and at least one more perfume from the line in a heartbeat! I have strange relationships with Tom Ford Jonquille de Nuit: when I wear it, I think that I like it – but then I never choose to wear it unless it’s for some special reason like comparing it to other perfumes, doing a brand week or, like now, for the Single Note Exploration series. Jonquille de Nuit is very floral, with a prominent narcissus note, but despite that it doesn’t read like early spring when blossom aroma interweaves with greenery and earthy scents but rather a warm pre-summer bouquet with everything in full bloom. Both Yosh White Flowers and Jo Loves No. 42 The Flower Shop I wore from samples. I had White Flowers for years, tested it briefly and completely forgot about it. Recently when I decided to send one of the two vials of White Flowers to a parfumista friend, I tested them to make sure they didn’t turn and was amazed at how much I liked it. It smells beautifully of a lot of flowers, and so does The Flower Shop sample, which I have “on loan” (for testing) from another parfumista friend, and which, in my opinion, is one of the cases of the name perfectly fitting the scent. These two perfumes are different bunches of flowers – thus have different aromas but they both have a similar feeling of the presence of that bunch, and I like both scents. Enough to do anything about it? I’m not sure but I plan to do more testing. It was Penhaligon’s Ostara that reminded me about my secret admirer and gave me the idea of doing post for this note. This perfume actually epitomizes narcissus flower for me: it’s sunny, and bright, and happy, and uncomplicated. It doesn’t come even close to be worth Penhaligon’s full price but last year’s sale deals invited Ostara into many homes, from what I’ve read on different perfume forums. I bought a bottle for myself. I bought another bottle as a present to my friend. I enjoy wearing Ostara as my spring perfume, and this year I wore it as an anti-#BeBoldForChange: even though it’s not my holiday any longer, I refuse to politicize it because it’s still a nice and loved holiday in my native country. I am a feminist the other 364 days of the year; I do not have anything to fight for on this one extra day. Do you like narcissuses – in perfumes or in a vase? Did you ever have a secret admirer? Have you ever been one? This entry was posted in "Four legs good", Favorite Perfumes, Not a Review, Single Note Exploration, Weeklong Test Drive and tagged Eau de Narcisse Bleu, Hermès, Jo Loves, Jonquille de Nuit, narcissus, Ostara, Parfums DelRae, Penhaligon's, The Flower Shop, The Revenge Of Lady Blanche, Tom Ford, White Flowers, Wit, Yosh. Bookmark the permalink. The celebration sounds truly wonderful, we should indeed have such a day AND international women’s day too! It’s still needed, but I like your idea of all the rest of the days in the year being WID :-) I’ll go with that. Today the sun is shining like it’s almost spring (I don’t trust it) so what a great day to thing of narcissus perfumes. I’m afraid my narcissus perfumes are limited to one! Narcisse Noir, which is a tough one to wear, even though I never fail to get compliments when I do. And two decants; HdP Turandot a cool spicy narcissus and fleur de narcisse a DC’ed L’Artisan perfume. Our weather is very pleasant now: warm but not too hot yet. Today I took several pictures of narcissuses “in the wild” – they are so beautiful! My old cat, Symmie, would definitely have eaten the flowers! And then been sick. We stopped having flower arrangements as we could’t risk him poisoning himself. I love the flowers but find the note doesn’t always work on my skin and can give me a headache. When I was (very) young Max Factor had a lovely fragrance called Jonquille which was good; it’s strange that “cheap” perfumes of days gone by were actually better quality than some of the very expensive, niche ones of today! I hadn’t realised that Climat and 19 contained narcissus – I’m always learning something! 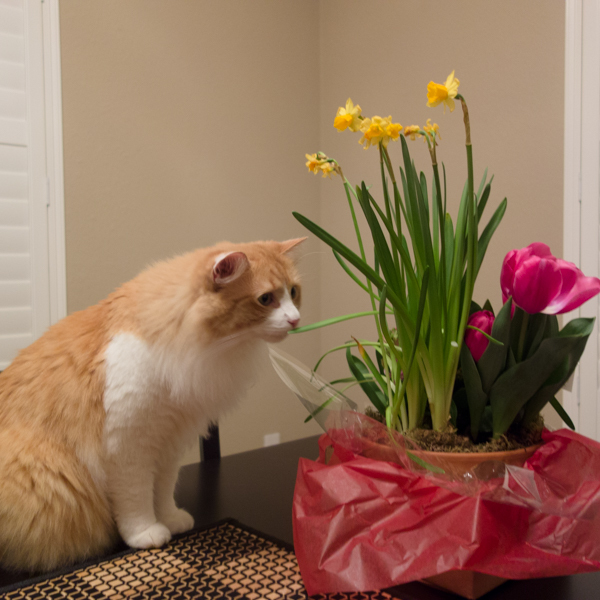 Yeah, some cats just cannot be trusted with flowers! I don’t know how they survive in nature! How sure are you about those perfumes from old(er) times? After my experience with one of my childhood favorites, I’m not sure any more – though it still might be the case, and they actually were much better. Your version of International Womens Day sounds lovely! I was saddened to hear that some schools were closed on Wednesday due to female teachers striking/protesting and single moms having to take a day off from work so that they could babysit their children who could not go to school. Kind of defeats the purpose in my eyes. 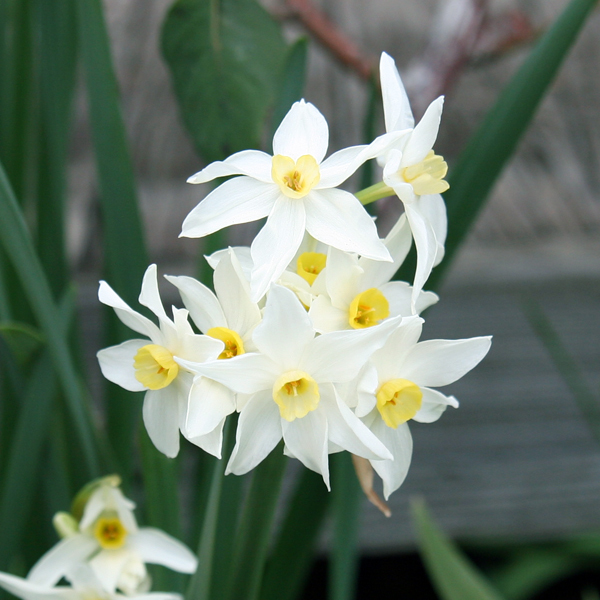 I love narcissus as flowers and also in perfume. I have a travel size of Dame Narcissus (which is true to life!) so I will join you in that this week. I need to try Dame’s Narcissus: I liked at least a couple from the line, so this one might also work for me. Be prepared, though, it is very potent! As you know, I love the stories from your childhood and this was another great one. You knew how to celebrate holidays properly and I can imagine the memory of the bouquet from the secret admirer staying with you vividly. I have been a secret admirer too many times but never had one myself. I adore narcissus but want to find it in a perfume with a bit of the earthiness of narcissus absolute. Often they are too light and floral for me but I’m still searching. Too bad about the gorgeous opening of Lady Blanche fizzling out so fast but I’ll give it a try when I come across it. Iris and narcissus sounds like a great combination. I also need to give the Hermes another try now spring is here. I could easily go for a 15ml bottle if I can find one. if Undina does not mind me chiming in, I will suggest that Dame Perfumery Narcissus Soliflore might be what you are looking for. Thank you, Tara. As you know, I love telling stories :) Thank you for reading. Those 15 ml bottles are very nice. And they all come in different colors. In the U.S. you can buy them only in sets of 4 (in any combination of perfumes) – the same as with their Hermessence collection. But I heard that in Europe you can buy a single 15 ml Hermessence perfume. I’m not 100% sure, and I don’t know if it would be the same for the regular line but you should check. I love narcissus and daffodil flowers. Their scent is amazing. I don’t think I have ever found a perfume that really captures the scent, though. Ostara didn’t do it for me. I’ll just continue to love the real flowers when they bloom. Love your story of the mysterious bouquet! Tuxedo cats are my second favorite after orange cats. Most live flowers smell better than any of its recreations in perfume – be that an artificial molecule, real absolute (and other forms of extracting the scent) or a recreation by different flowers. On the other hand, I rarely want to wear true soliflores, so for most flowers I can find a nice perfume bouquet. Love Narcissus in perfume, Ostara is near the top along with Dame’s Narcissus soliflore and best of all, Bruno Fazzolari’s Au Dela Narcisse Du Montaigne. Would LOVE to find a true Daphne scent that smells like the bush we had in my parents garden while growing up! If you ever do, please let me know! Nice post, Undina! Yes, I had a secret admirer. The summer after my sophomore year in college, I got a bouquet of fresh flowers right outside my house and original poems via snail mail. Honestly, it was creepy, especially because I never found out who he was. I was also surprised at the number of perfumes I have that contain narcissus! No. 19, probably my most worn perfume, Delrae Wit, Kelly Caleche Parfum, PdE Tabac Tabou, Coco Noir! Just containing narcissus I found more than 30 perfumes (including samples), but not in all of them I can actually smell that note. I think that had I gotten flowers here, I would be creeped out. But back then and there it didn’t feel dangerous. And he gave those to my mother – it’s hard to imagine something more innocent. I like CB I Hate Perfume’s M#1 Narcissus. It seems to be the right time for it now. I agree: it feels exactly right for spring florals. I was never a fan of narcissus (or żonkil, as we call them in Poland) and in fact it would be very hard to me to come up with a perfume name that features this note. I always liked how narcissuses looked but those that were prevalent in my childhood had almost no scent. Now, when I know how the local ones smell, I like it. I really enjoyed your story of a secret admirer, because as with Valentine’s cards from unknown people, such gestures are so much more exciting than gifts from those you know and come to expect, lovely as those are too! I once had someone stalk me with boxes of chocolates left on the doorstep, which like hajusuuri said, rather freaked me out. The fellow turned out to be someone really geeky and weird. To have a secret admirer be the exact same person that *you* secretly admire, now that would be something! On the subject of narcissus scents, I only know Ostara and Jonquille de Nuit on this list and like both. I have drained my Tom Ford sample but you’ve prompted me to hunt for my one of Ostara now. I am ashamed to say I had no idea till this year that there was such a thing as International Women’s Day. Every day is a something or other day, and they all wash over me – my bad! About food: several year ago somebody sent me a box of truffles to the office. Unfortunately, the site, from which those were sent, didn’t include any card or other form of identification. I waited for a while to whoever of my friends did it to inquire whether they got to me safely but since nobody did, I didn’t dare to eat them. Haha, exactly, we need more secret admirers. I like the bottles as well but not enough to actually contemplate splurging on any of them. There are some holidays and events that seem very important to those who lives where those are celebrated, but might be completely lost on others – even when they know about the existence of that occasion (and especially when they don’t :) ). Thx for the post! It made me dig for a sample of ‘Central Park West’ form Bond No.9, to see how the listed ‘narcissus’ performed there, and how it related to some of your impressions. Ha! It was quite an unexpected journey, must say! Probably expecting something along your impressions of Ostara, I got nothing of sorts, apart of a big surprise all day long of wearing it! (Dis/Pleasures of surprise :-) Thx for the inspiration!